There’s a great, witty premise at play here, and it’s carried out nicely for two-thirds of the movie, before finally losing some steam in the last act. 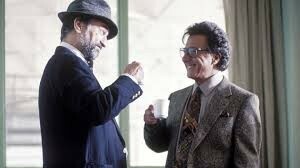 Wag the Dog is a fun movie. It’s a film by Barry Levinson, the great director who was coming off Sleepers from the year before this. That movie featured both Robert De Niro and Dustin Hoffman in supporting roles. You can bet it was while working on that film that Levinson had the idea to give them a little more to do in something like this. Wag the Dog turns out to be the perfect vehicle for both of them, allowing each actor to expand muscles in ways they haven’t done before. Considering the talent on the table here, and how much each actor had already done in his career at this point, the fact that this was new territory for both of them is a huge accomplishment. For Deniro, he had done everything from channeling Brando in the Godfather Part II to playing a partially paralyzed and frozen cripple in Awakenings. For Hoffman, it was everything from Rain Man to The Graduate. These are the guys who would later team up to be the iconic figures in the Meet The Parents sequels. Those films might have been lousy, but here, in Wag the Dog, the actors were given a fun and exciting, and most importantly fresh script to work with. The idea is that the president has just had a sexual fling with a young girl who was visiting the White House. It’s a scandal that is about to break. Ironically the movie came out one year before the Clinton-Monica Lewinsky scandal. There must have been something in the air back then, in the late nineties. 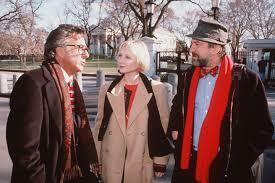 The thing that ups the ante in Wag the Dog is that the president is only eleven days away from the next election, where he is running for a second term. That means the scandal needs to be delayed or put on the back burner for only eleven days. But how do you do that? The solution in this movie is first to bring in a crisis dealer. A fixer. The movie opens with a comercial that we will see different versions of throughout the film, but shortly after that, we are at the White House at night as Conrad Brean (DeNiro) is walking in, past security. Winifred Ames (Anne Heche) the president’s head of public relations is talking to someone about how this is the guy, as Conrad strolls in. Then the three of them all run down multiple levels of stairs to a top secret room where the food staff is immediately dismissed. Now, Conrad gets to work. He tells them of his plan to distract the media. He doesn’t have it all figured out yet, and in fact, one of the charming qualities of his character in these first few scenes is how whenever he doesn’t know something, he says, “I’m working on it.” In other words, he doesn’t just make something up on the spot, but instead, lets us know that the wheels are in motion and the gears are moving around his head. What Conrad does do in this first scene is show us how quickly gossip can start by bringing up a story that is not true about the President working on a B10 bomber. When one of the aids says, “but he’s not working on the B10 bomber,” Conrad responds in agreement, saying the President is not working on the bomber. Only hearing him deny it makes it sound like there’s something he’s hiding and maybe it really is the truth. In other words, just by denying something, it puts the story out there, into the media, and makes them suspicious. Soon the plan turns into an idea to create a fake war. It’s the only thing these guys can think of that might actually take the nations attention off of the scandal. Especially at this crucial time. If they can get the media to believe in the war, then it will make the front page of every newspaper all week long, instead of the scandal story. So that’s exactly what they do. First they go to a Hollywood producer and recruit him to help out. This is Stanley Motts (Hoffman), and he is sensational as a guy who has finally been given a gift that encompasses all of his talents. Stanley is a producer who has never won an Oscar, and yet he has been tapped by the awards ceremony to produce the event for television. He’s certainly bitter about having never won. Stanley and Conrad get to work on coming up with ideas. They decide to make Albania the country that we are going to war with, simply because most Americans don’t know anything about Albania. Then they bring in Dennis Leary as another producer, Willie Nelson, as a song writer, and Kristen Dunst as an actress. These guys begin to film a quick scene of Dunst running down a street in Albania, cluthcing a kitten, in terror. The scene is done on a soundstage with blue screen all around her, and it all looks and feels great, except for one problem. Stanley is not a director. He’s a producer. And yet, he’s acting like they are one and the same here, as he calls the shots and exactly how this scene they are making should be filmed. What this movie really should have done is brought in a director as well. And considering we never really learn exactly who Dennis Leary is playing, maybe he could have been that director. Still, minor quibble aside, this first half of the movie really works nicely. So does most of the second half. When a monkey wrench is thrown into their plan by the other candidate for office getting confirmation from the CIA that the Albania conflict is over, the guys need to brainstorm once again. This time they come up with the idea of a soldier getting left behind, and putting a hero into the story. Then they take this soldier, named Shuman (Woody Harrelson), and make a national campaign about bringing back a trusty old shoe. They even start a symbolic effort of throwing tied shoes into the air on telephone pole wires. All this is great. So is the way they just chose the soldier based on his name, without ever meeting him. But then, for the final third of the film, they do actually meet this man, and the movie takes a bit of a dive. It’s nothing major, and the story does get back on track for it’s ending, including a few cool twists, but for a while there, things started to look pretty dire. Basically Woody Harrelson is no good for this part, and it’s not really his fault as much as it is the writing and what they give him to work with. But that storyline is pretty minor and doesn’t take much away from the film. Especially since it is able to find it’s footing, once again, right in time for the ending. Getting back to that national commercial, it’s something that keeps playing in the background on TV, throughout the movie, about not switching horses in the middle of a race. The reason why it works is because it is always there, in the background, and it finally becomes relevant by the movies ending. I like when movies have ongoing advertisements or events going on throughout the film, whether it’s a song that is making the rounds on the radio, through different stations (Love Actually, Hearthers) or a baseball series where every day is a different game (Bad Lieutenant.) This movie uses the commerical for that element. It’s a good, smart film with a clever plot. Still, it definitely starts to get a little tiresome in its final act. Maybe it’s because the longer the movie goes on, the more ridiculous the premise seems. Wouldn’t men from the army be reporting home that nothing was actually going on with Albania? This movie makes the argument that the Gulf War was similarly staged. It’s still a little hard to believe. And yet, if you do suspend believability and just go with it, the movie turns out to be a lot of fun.